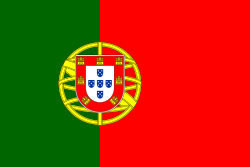 The banner o Portugal (Portuguese: bandeira de Portugal) is the naitional banner o the Portuguese Republic. It is a rectangular bicolour wi a field unevenly dividit intae green on the hoist, an reid on the flee. The lesser version o the naitional coat o airms (i.e. airmillary sphere an Portuguese shield) is centred ower the colour bundary at equal distance frae the upper an lawer edges. On 30 Juin 1911, less nor a year efter the dounfaw o the constitutional monarchy, this design wis offeecially adoptit for the new naitional banner, efter selection bi a special commission whose members includit Columbano Bordalo Pinheiro, João Chagas an Abel Botelho. The conjugation o the new field colours, especially the uise o green, wis no traditional in the Portuguese naitional banner's composition an representit a radical republican-inspired chynge that broke the bond wi the umwhile releegious monarchical banner. Syne a failed republican insurrection on 31 Januar 1891, red an green haed been established as the colours o the Portuguese Republican Pairty an its associatit movements, whose poleetical prominence kept growin till it reached a culmination period follaein the Republican revolution o 5 October 1910. In the ensuin decades, thir colours wur popularly propagandized as representin the hope o the naition (green) an the bluid (red) o those who dee'd defendin it, as a means tae endou them wi a mair patriotic an dignified, therefore less poleetical, sentiment. The current banner design represents a dramatic chynge in the evolution o the Portuguese staundart, which haed aye been closely associatit wi the ryal airms. Syne the kintra's foondation, the naitional banner developed frae the blue cross-on-white armorial square banner o Keeng Afonso I tae the leeberal monarchy's airms ower a blue-an-white rectangle. In atween, major chynges associatit wi determinant poleetical events contributit tae its evolution intae the current design. Wikimedia Commons haes media relatit tae Flags of Portugal.